Mere return on investment shouldn’t be the only criteria influencing your investment decision. Let’s look at some other important factors that are often overlooked and should be taken into account before you start investing. As inflation grows, it reduces the purchasing capacity of your money. An apple that costs Rs 100 today will cost Rs 105 a year later. This means, in the future you will no longer be able to buy an apple with Rs100. If the return on your investment can beat inflation it’s a profitable investment. Higher the post inflation return, closer you get to your goal. So if inflation is at 6% and your FD gives you a return of 7% then your post inflation return is less than 1% and we haven’t even taken tax into consideration. If your investment attracts tax, then your post tax return will be lower and will impact the amount you get on maturity. Interests earned from FDs get taxed yearly as per your tax slab and banks also deduct TDS on it. On the other hand, Equity Mutual Funds held for more than 12 months are exempt from taxation and Debt Mutual Funds held for more than 3 yrs are taxed at 20% with indexation benefits (indexation is the Income tax benefit that takes into account inflation from the time you bought the asset to the time you sell it, thus reducing the taxable amount). This allows your money to grow further through the power of compounding. FDs can have a lock in period ranging from 1-10 years depending on the type chosen. Premature withdrawal or closure of a FD attracts penalty which could be 0.5-1% lower than the rate applicable for the period the FD was held. Mutual funds can be liquidated/redeemed– fully or partially at any given point of time. The money arrives in your bank account within a couple of days. Plus you do not give up the interest you earned during that period of time. And even though some funds charge an exit load fee if units are redeemed within the predefined period, it is negligible (0.25%-0.5%). The common misconception around Mutual Funds is that they invest all their money in the stock market. In fact, 65% of all money in the Mutual Fund sector is put into Debt mutual funds (Debt funds put your money in safe assets like Government or Corporate loans – just like the banks). To analyze, how Equity Mutual Funds compare against the Fixed Deposits, experts at MintWalk analyzed the NIFTY returns all the way from 1995 to 2016 and found that an SIP of an Equity Fund with a time horizon of 3-5 years ensured high returns and low risk. If your goals went as far as 10 years (Retirement, Child Education, etc), then you would have earned an average annual return of up to 15.2% without exposing yourself to too much risk. Bottom line is Mutual Funds that invest in short term debts are almost as secure as Fixed Deposits and Equity Mutual Funds are also safe in the long term. Even though you might be a conservative investor who believes in FDs, it is always a good idea to diversify your portfolio by making some investment in Equity or Debt Mutual Funds. This will help you beat inflation and give your money a chance to grow and work for you. Mutual funds are a good tool to help you achieve your short term goals like saving for vacation, car, post graduation, etc and also long term goals like retirement, child education, home, etc. To make investing in Mutual Funds easier for you, MintWalk chooses the right blend of funds just for you based on your age, tax bracket and time horizon. Our app recommends only those funds which are pre-approved by our team of experts thus saving you a lot of research time. 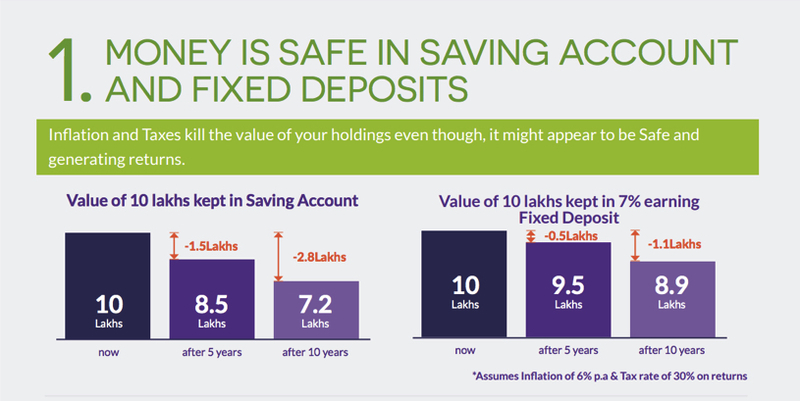 Fixed deposit is not a risk free investment. Bank only take liability upto Rs. 1 lakh.